When your job or relationship ends, this forces open a door to other opportunities. It may seem like your world is ending, but it is simply the end of one chapter and the beginning of another. We need to learn from the past, not live in it. I can hear some people now. "What does he mean, only the end of a chapter? This job, this person has been my whole life!" I am not making less of your work, or of your relationship, at all. When change is forced on you, it can create a terrible loss and it is appropriate to grieve about it. But you do no credit to the memory of the person you loved or the great job you did, if you shut down and refuse to go on. You can honor the past by the way you face the future. The love you felt for one who is gone is not lessened if you brighten the lives of deserving others by giving them freely of your affection, admiration and love in order to create a new life for yourself and others. Shutting yourself off from life helps no one, least of all yourself. In the same way, losing a well-deserved position, for which you have struggled mightily, is one of the unkindest blows that can occur. When it occurs going into the holiday season, it seems like the cruelest betrayal that could happen. This is not an idle question. Your career depends on how you answer it and you must be able to answer it accurately. Feeling powerless can happen at any point in your career curve, and it is essential to your continuing sanity that you learn to recognize what is going on. If you are doing a creditable job and applying yourself to making your employer succesful, this can be one of the most important indicators that you are seriously at risk. After consuming as many scones as I could decently get away with, we hugged our new friends goodbye and set out on snow-covered roads toward home. Although the snow crunched and squeaked underfoot, it was a virtual heat wave, because the temperature had finally risen from 5 to 19 degrees(F). The roads were still slippery, so I drove carefully out of Vermont and headed south into Massachusetts. The western part of Massachusetts is beautiful in any season. We drove through Williamstown which has colonial houses and a town green where local militia once drilled. This is just one of many early towns like Longmeadow and Concord, which serve as a reminder that our history began with people carving a life out of a rude and unforgiving environment, yet taking the time to create towns that still appeal to us. After hours of Massachusetts byways, we broke free and coursed swiftly over turnpikes and throughways through New York state and Pennsylvania. We are staying at the Hampton Inn in Hazelton where high speed internet access is instantly available by opening our laptop. The one, tiny drawback to life in the southwest corner of Vermont is that I was not able to find easy internet access for my laptop. My previous post was entered on our host's computer. I am beginning to formulate an ideal scene for a place to live. So far, it involves a rural environment with fiber optic connections to the internet. Sounds improbable? There are more places like that every month. Fiber is opening up rural American to growth like the railroads opened the country to settlers in the past. Hope you are all enjoying your Holidays. We made our way through freezing winds and snow to the warmth and hospitality of Shearer Hill Farm. This Vermont bed & breakfast offers home made scones... and delightful conversation...in the casual ambience of a 220-year-old farmhouse. This blog is coming to you courtesy of the wireless access at the Hampton Inn in West Hazelton, PA. I am blogging in my room without the nuisance of finding and using the data connection on the room phone. I just fired up the laptop and it informed me that the hotel had a connection waiting for me. Did that ever bring a smile to my face. Another Christmas present! In the last few years, getting internet access on the road has been transformed from an ordeal to effortless simplicity. Two years ago I crossed the country twice while moving from San Jose, California to Charlottesville, Virginia. On those trips, too many motels either had no internet access or an expensive and slow dial-up access. I was offline for two whole weeks, an eternity in internet time. Since then, wireless internet access has been creeping relentlessly across the country. Our five-year old Toshiba laptop recently started producing pop-up windows announcing wireless network connections. We didn't know that it had wireless capability, and now it won't shut up. Every time we turn it on, it finds more and more open connection points. 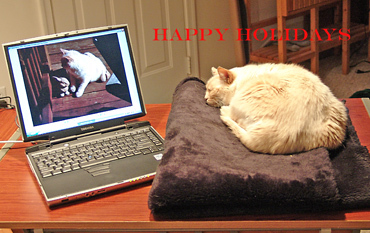 I want to wish all of you a happy holiday season and tell you how much I have enjoyed your visits and your emails. We can't all curl up in a warm place with our old photos like Buffy, but we can reach out and make some else's life a little better by showing them we appreciate them. This is a difficult time of year for many people, so do what you can to keep their dreams and yours alive. We will be traveling many miles this coming week, so blogging may be lighter than usual. I will be taking the pictured laptop with me and looking for wireless network connections along the way. You are being perceived as a liability by your coworkers. Whatever you have, they don't want to be contaminated by it. You walk around with a hunted look, trying to force a confident smile. It is a truly awful time for you, and there is only one way to handle it. Harry Potter - victim of Onion satire? UPDATE: Welcome Harry Potter fans! You're among friends. You can see another post about Harry here. When credulous religious figures run amok with dire warnings about Harry Potter's effects on children's morality, it bears investigating. Especially since I have read all of J. K. Rowlings books and found them to be highly inspirational and morally uplifting. It all started when the Onion, a satirical publication, wrote an article on July 27, 2000 which purported to show the inside skinny on how the Harry Potter books were leading children STRAIGHT TO HELL!!!. Sorry to disappoint anyone, but this is just another well-documented Urban Legend. The Harry Potter books are excellent entertainment, not a shortcut to perdition. In fact, the Harry Potter books have sparked a tremendous upsurge in children's reading skills. Before we go any further, let's clear up what satire is: IT IS NOT TRUTH! Humorous satires often base the humor on the juxtaposition between the satire and reality. The humor of such a satire tends to be subtle, using irony and deadpan humor liberally. The Onion article is so exaggerated, even using obscenity for humorous effect, that it is hard to imagine that anyone would take it seriously. However, several professional "witch-hunters" have written books about the "evil Harry Potter" and are trying hard to make a living preying on concerned parents. This post deals with strategies you should consider while your career curve is still going up. All of the advice that follows assumes that you are giving your job every thing you have got. If you read my last post, you might be thinking, "Why is David cheerily laying about with such bleak news? Don't we have enough trouble coping with waffling managers and impossible deadlines? Why should we be looking forward to old age and reduced circumstances?" Because you can do something to ensure a more satisfying future. Gravity does not let up because you ignore it. Neither does the law of supply and demand. You will stay employed as long as you have skills that are in demand AND IF you are still attuned to the rhythms of the group you work with. No matter how well off you are today, either one of these can go wrong in a relatively short time. Your hard-earned skills can become expendable in several common scenarios: a takeover occurs, new operating procedures are introduced, the technology you know is replaced, etc., etc. I have been visiting a lot of business blogs lately and I am amazed at the panoramic breadth of topics covered. Almost every aspect of business organization, motivation, and leadership is analysed exhaustively. Most business blogs focus on those things that will bring success to an organization. Few target the career aspects or the personal cost of being an employee. Although Ripples occasionally gets listed as a business blog, my primary intention in discussing business matters is to provide insight on the hidden costs and benefits of working for a living and how to optimize the results for yourself. In the end, the most important thing about your work is whether it actually helps you to live a more meaningful life. I truly believe that the work opportunities of the future will become both more distributed and more concentrated. There may be many millions working remotely or in small enterprises, but there will be many more laboring at workstations in vast hives at a machine-paced rhythm. I'm exploring post-corporate life as a writer and entrepreneur. If my writing helps others, I have achieved my purpose.